Lately, a lot of the refashions I’ve attempted have failed. I won’t share the sordid details with you here, because finally I have managed to ‘not-fail’! Hooray. 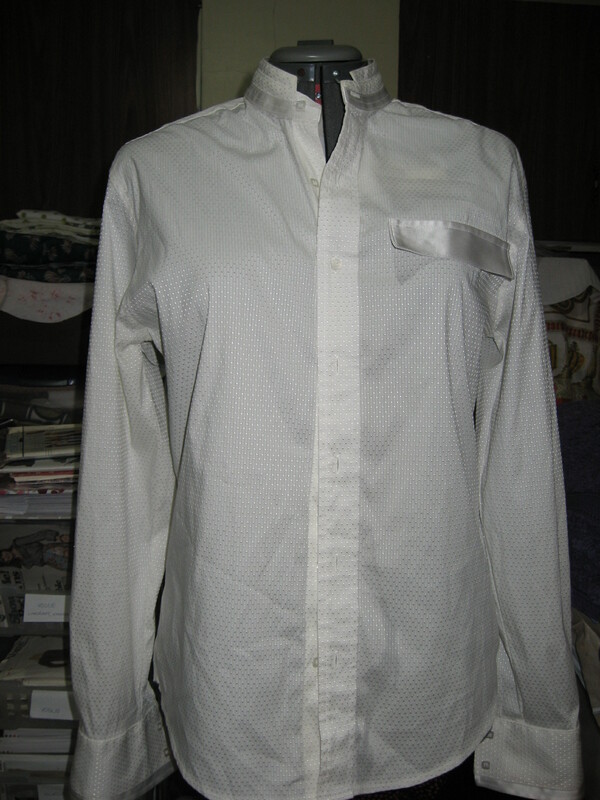 I started out with this men’s dress shirt; op shopped for I think $4. It is a stretchy fabric with a sort of stitched detail that I really liked – made it a tiny bit glam! The pocket detail wras just a little flap, not a pocket at all, so that was easily removed. So I’ve been poring over Pinterest and even skimmed over Anthropologie. Gradually I got some ideas of the kinds of shapes I was after. I’m not much of a designer, so I used this blouse pattern from Burda Magazine June 2011 to help me out. The top has a side zipper, but I loathe side zippers so I decided the buttons on the front of the shirt would become the closure for this top, and they would do it from the back of the shirt. 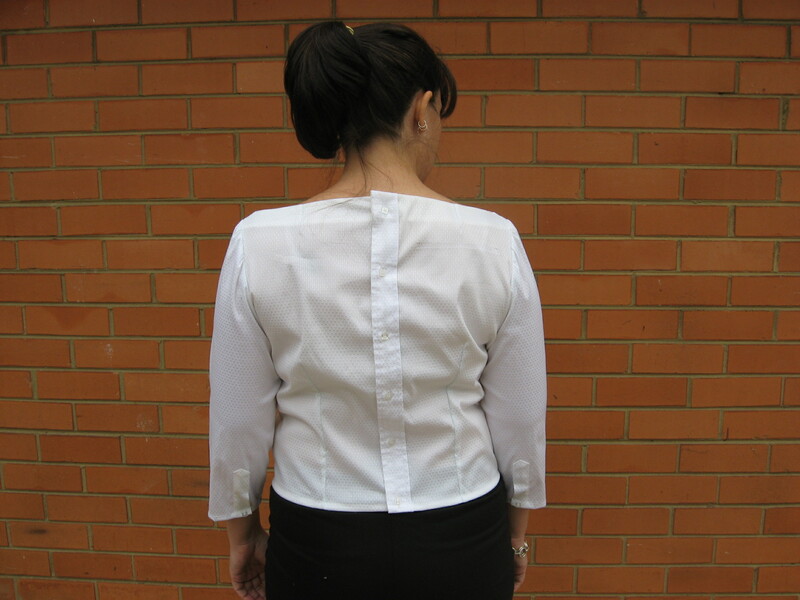 I laid out the shirt and found a centre line, pinned my pattern on and chalked around it, then flipped the pattern over and chalked the other half of the back. I positioned it so there would be a button at the top of the back (with enough room for seam allowance). Handily, this also put a button at exactly the right spot at the bottom as well. I decided to chalk my patterns on before I decided to cut open the seams, in case I could use the existing side seams; it seemed to me that the shirt fabric would be stretchier than the stretch poplin recommended for the pattern, but because I’ve been having such bad luck with my refashions I was being a bit careful! 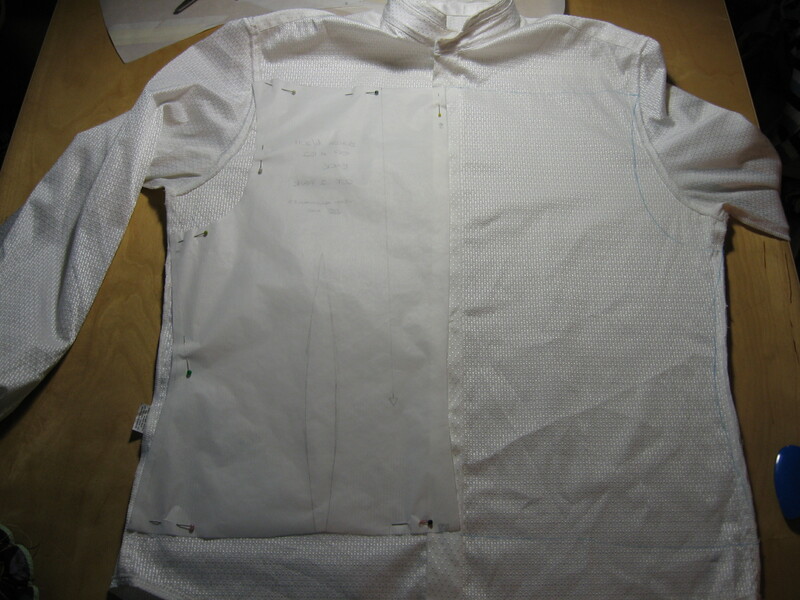 Sketching the front pattern on to the back of the shirt came next. Again, found the centre line and positioned the pattern from that. 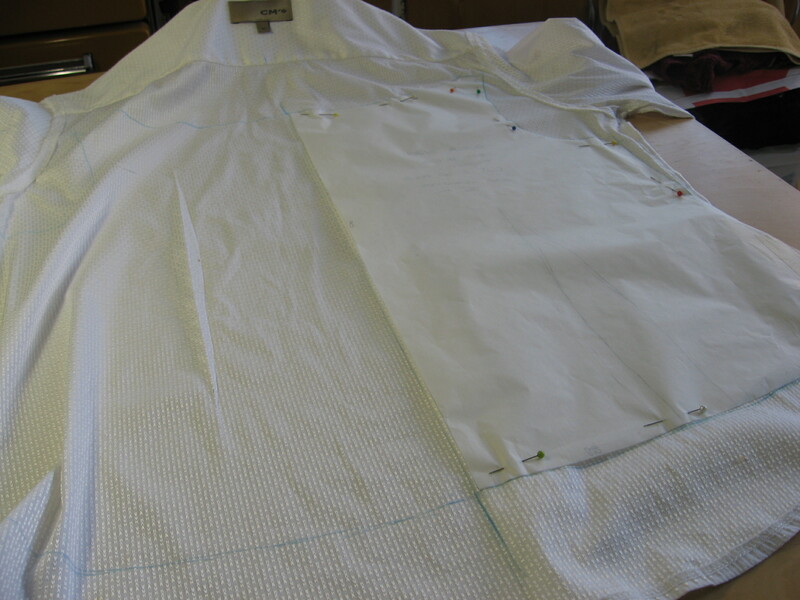 I decided to unpick the side seams after all, although later I realised I could have used the existing seams. Not to worry – I’m an expert seam ripper and it only took a couple of minutes. I thought I was going to have to add in a little extra around the hip area, but the fabric was stretchy enough to accommodate my womanly curves. 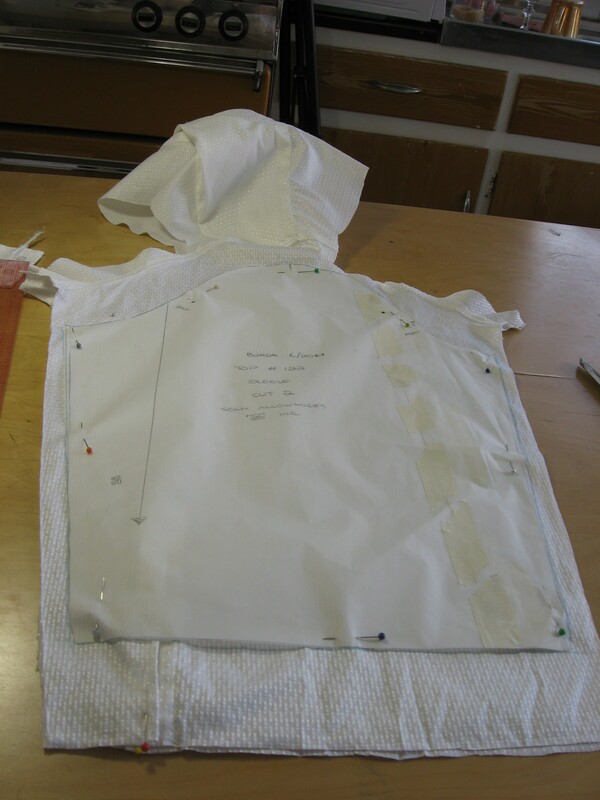 After I cut out the front and back pieces, I unpicked the existing dart from the old shirt’s back – which is where I came across my first stumbling block. Cutter’s marks! 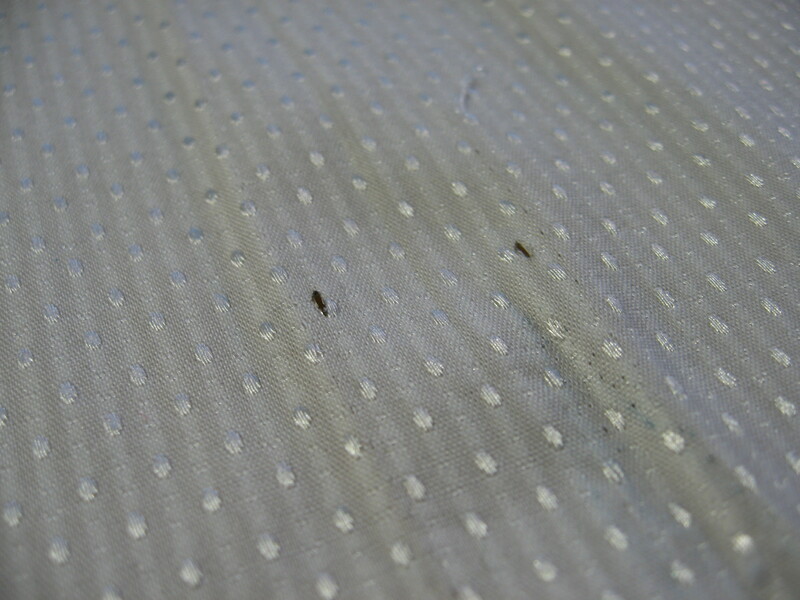 These are used by apparel fabric cutters to mark darts – around the edges they use notches, but obviously that won’t work for darts, so they punch little holes instead. Funnily enough I learned this only a couple of weeks ago at a pattern drafting course! Anyway, although these holes were tiny, they seemed really obvious. Luckily I was going to be putting darts in myself, although mine were – of course – not going to cover these little holes. So I faffed around with my darts until they did cover the holes. Problem solved. So then I needed sleeves, which came from the sleeves of course! Then it was just a matter of sewing it up. There was enough fabric in the yoke of the shirt for the neck facings. 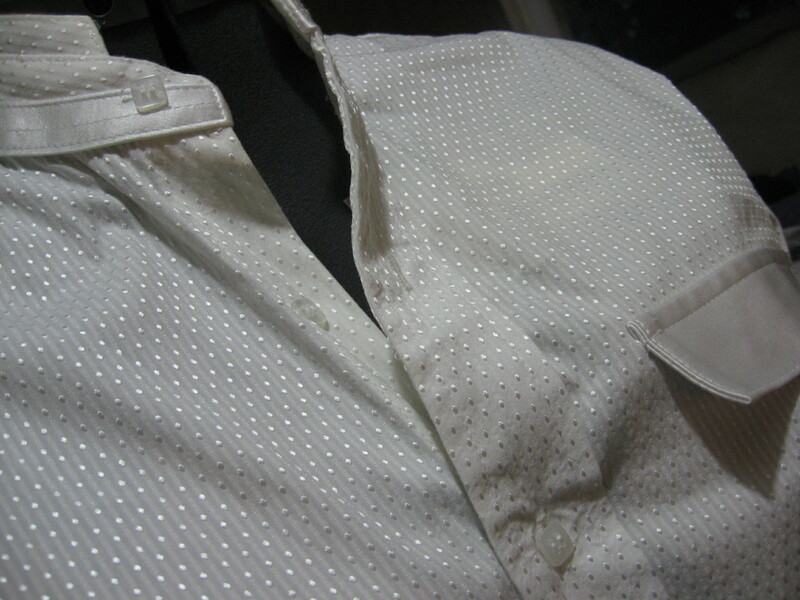 I did have to take off the top button and re-sew it once the facing was in position, and stitch over the buttonhole which the facing now covered – I still needed the buttons to be functional. 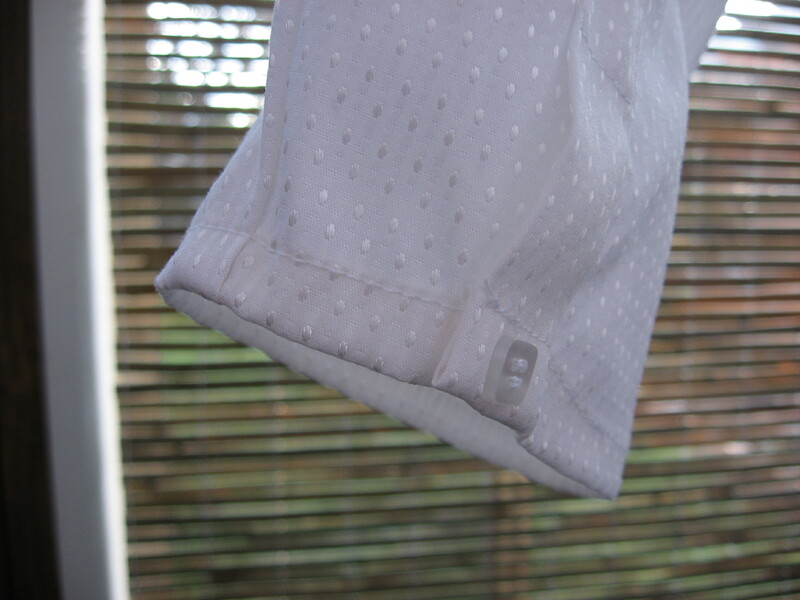 Because I had buttons to spare, I used a couple on the sleeve edges where the cuff openings still existed – I didn’t want the openings to be flapping about, and a button seemed an appropriate way to make that happen. I adore this top! I love the button up back, and the button detail on the sleeve is too cute! 🙂 Very feminine too! Nicely done. I love it too, never thought to put the buttons in the back!